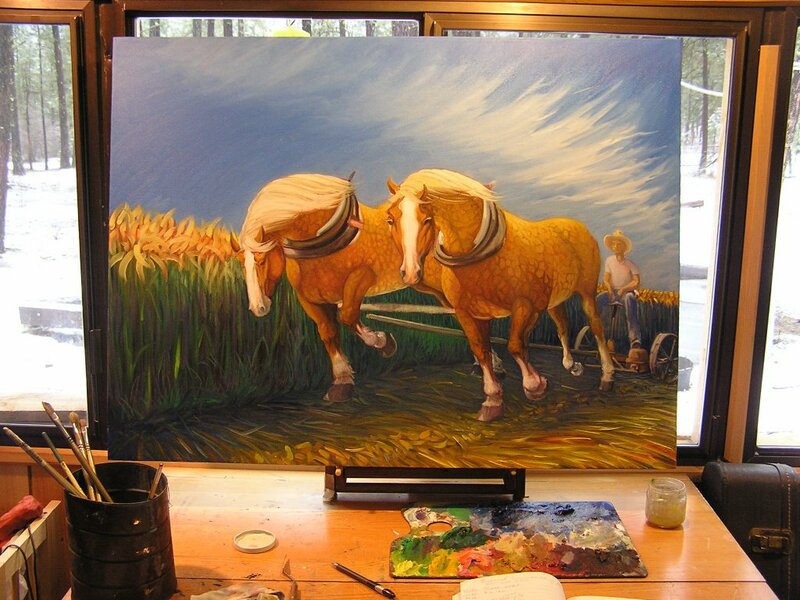 painting, belgian team, mowing 30"x40"
I've been working on a large painting of a team of Belgian horses mowing hay. This isn't necessarily my team or any of my horses as mine are more 'red sorrel' horses except for the mare Windy who is a blond sorrel but has an unusual grey mane. It is a large painting for me but was not at all a problem. Being a person 6' 3" I find larger paintings to fit my physical nature. I also keep from overworking the painting as there is so much area to cover I can move around in the painting. I did the sky first. I had wanted to do cumulus type clouds but after 4 hours or so I ended up with a sky of 'mares tail' cirrus clouds that ended up fitting the composition quite nicely and are appropriate for the month of July when I am usually haying and are a good sign to a farmer as they represent a high pressure front of clear weather. I've had plenty of hay rained on, more when I was using machinery and had more hay to put up and had to start in June when the weather was chancy. Now I only cut 40 acres or so and can wait for the brome grass to get more mature and lend some grain to the hay. For the last two years the brome has looked more like oats it has been so heavy. The six horse I feed through the winter really like it and what they don't eat gets shook out on the ground and makes for good hay the next year. 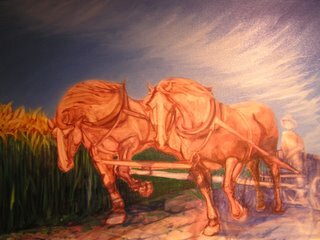 I'm not done with the painting and have the harness to put on the horses. I've included the grisaille stage (imprimatura underpainting) just to show the progress. It's a different way of working than the imprissionistic rendering of the "Season Series" that I have yet to finish. I order stretched canvas from a distributor. 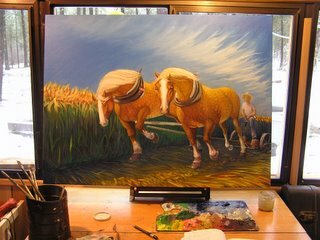 It is incredible to be able to purchase such high quality canvases that are made in China and shipped to me in Washington from N.Carolina distributor. A 30'"x40x2" deep canvas is only $30. Some would think it improper to buy from exploited chinese workers but I'll bet, like the fall of the USSR, China will change due to the influence of Capitalism. Can't say that's a good thing either for us or them but it is a possible reason we would have fewer differences especially ones worth fighting about.